Thanks to Fairfield World for providing us with the bean bag filler and Fiskars for providing us with the scissors and for both being an awesome brand partners! Hey Guys! Today we have a fun tutorial for you. 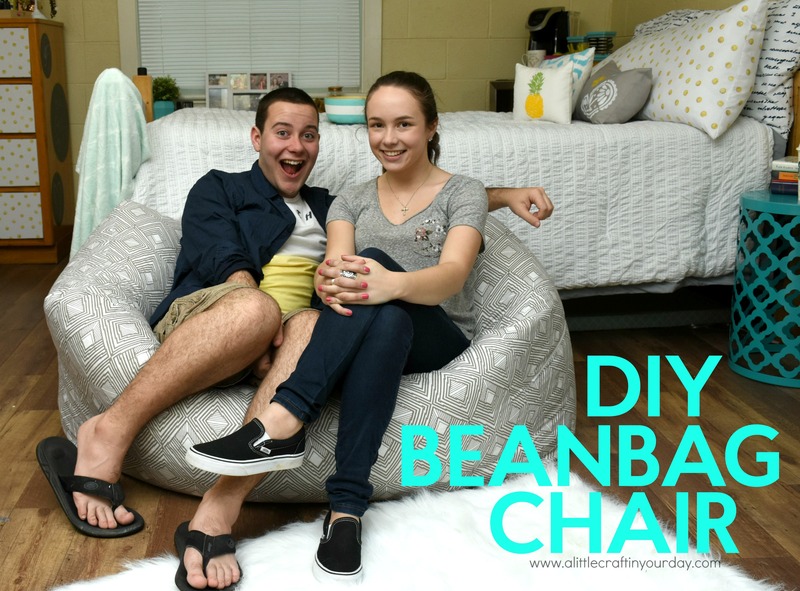 I am super excited to share how to make your own DIY Beanbag Chair! I’m sure you have seen lots of giant floor pillows and beanbag chairs made for multiple people. But if you have seen the price tags on those guys, they are not so cool. That is why we decide to make our own filled with Biggie Beanbag Filler! It was a lot of fun to make and the end product is amazing! It is so comfy and has been a hot commodity when I have friends come over! 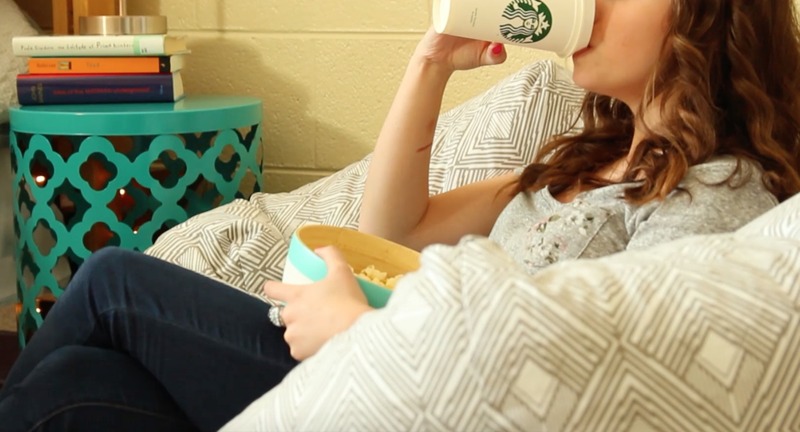 It is great for adding extra seating in dorm rooms or your room at home! Pick your favorite fabric and follow the video tutorial! 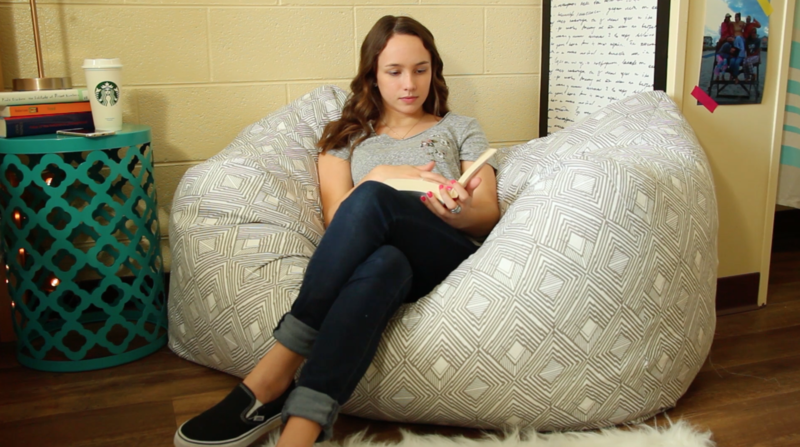 If you can use scissors and sew a straight line, you can make this DIY Beanbag Chair! So what did you think? Not so hard, right? If you want to make it even easier, I highly recommend using these Fiskars RazorEdge™ Fabric Shears for Tabletop Cutting. They cut through fabric like nobody’s business and make cutting a straight line on a flat surface a breeze. If you have any questions at all, just leave me a comment on the video or on this post and I will be sure to help you out. I really hope you all enjoyed this tutorial and enjoy your beanbag once you make it! This post was sponsored by Fairfield World and Fiskars. Thank you for supporting the brand partners that make A Little Craft In Your Day possible! How many bean bag filling do You need ? We ended up using 2! How many ounces of bean bag filler did you have to use for the entire thing? we used two big bags! Do you have the link of where you purchased it from? how many yards of fabric did you need? You will need to buy about 4.5 yards of fabric to make a bean bag of this size! How many cubic foot have you used ? do you cut the piece that is 26″ x 27″ in half for the zipper or do you cut two more pieces that are 26″ x 15.5″? you will need 2 more pieces! What was the 26×27 piece of fabric used for? For the front of the bean bag! There are 4 pieces that are 45″ x 26″. 1 piece that is 26″ x 26″. 1 piece that is 26″ x 27″. and 2 pieces that are 26″x15.5″ (8 pieces total?). You say in the video to cut the 26″x27″ square in half to make 26″x15.5″, which doesn’t make sense because 15.5 + 15.5 = 31?? After you sew on the 26″x26″ base, what do you do next exactly? you take the two 26″x15.5″ pieces and sew a zipper in between? But what do you do with the 26″x27″ piece? A lot of people have questions about this in your video, please explain! I thought they made that side that size because you will need that added 1 inch for th e zipper (1/2 inch for each side of the zipper). I’m not sure where that 26″ x 15.5″ measurement came from. LOL. And yes I agree, it is confusing. Materials used and the amount should be indicated on the tutorial like how long of a zipper do you need, etc. Can someone please help me, I’m confused and want to go get fabric to make this! I would love if someone who sewed could specifically write down the directions for me…..I’m a novice sewer and have no idea what to do. How long should the zipper be? Great job on the video . I’ve been wanting to make a large bean bag chair so I can’t wait to try it. I have seen other posts for making these chairs but because I am a very visual person, the video will be so helpful. Though I thought the video was done really well, I do think an additional step by step written after the video would be a great addition to the instructions. At this point I will just pause the video at each step which should work. Thanks for posting! Thanks for checking us out! Best of luck with your beanbag! We still love ours! Do you have written/printable instructions? The video is great to get an idea, but I’d like to have a clear reference to use next to my cutting table.